At the risk of sparking an infinite recursion, this very portfolio is a major component of the course. Aside from exams and tutorials from the textbook, the other major deliverable was a group-made website on a topic of our choosing. 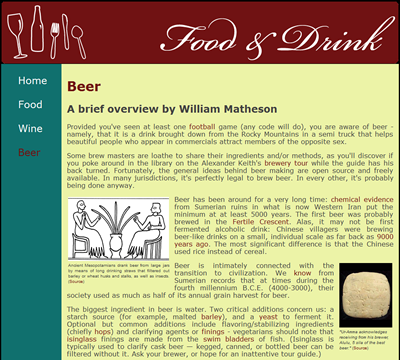 I wrote about beer. In doing so (or so doing, depending on your style), I learned a lot about it. I was surprised to discover just how long beer had been around. We're talking ancient Egypt and even ancient Mesopotamia. There would have been beer in the reign of Gilgamesh. Today, in the reign of Her Magesty The Queen, Elizabeth II, we're still trying to get marijuana, but at least we still have beer. I didn't mention it in the page, but my favorite beers are Island Red, Guinness, and Warka Strong (Hint: "Tak" is Polish for "yes"). If the Colt 45 at your neighbourhood liquor store could be replaced with Warka Strong, I think that would be a great leap forward for civilization.